At A & B Auto Body Ltd. we take pride in our work, and are eager to hear back from customers about what we’re doing right and what we could be doing better. Whether you are satisfied with our work or think we could do something differently, we want to hear it. Please leave a review on Google or our Facebook page. Excellent service. Everyone I spoke to was great to deal with. They fixed my car quickly and took care of booking my rental car, which made being without my own vehicle a smooth process. My side rail fell off and was dragging right outside A & B, so pulled in to see if they could help me. Well, they had me right out of there in under 20 minutes with it fixed – plus had solved a dent that was preventing my passenger door from opening – and didn’t charge me a penny! They were friendly and very efficient. I will definitely return for any paid auto body job I require in the future. Thank you so much! I would be remiss if I didn’t tell you how much I appreciate the way you handled my SGI claim and the subsequent repair of my 2008 Sonata. You truly went above and beyond my expectations by (1) liaising with my SGI adjuster to repair, rather than have it be declared a total loss; (2) arranging the repairs while I was away, thus saving me the frustration of being without a vehicle; (3) the courtesy and respect with which I was treated by your staff; and (4) being flexible and accommodating in allowing me to pick it up after hours. A big thank you to everybody. I will highly recommend your business at any opportunity! Best Service!!! Took my CRV here for an SGI claim, and they fixed her up in a day and washed it. I will definitely be back if it’s ever needed. 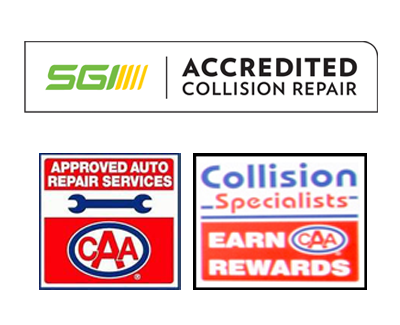 Great Service… Very skilled repair shop, and I’ve used them several times. My car was recently side swiped while parked outside my house. The scrapes were pretty minor so I decided to go get a quote on the damage repair. Within 15 minutes, they had driven my car into their shop and buffed/ fixed it for FREE! They also put a dab of paint where the paint had been removed. They even cleaned off my headlights so that they let more light through. This service was unreal and I highly recommend giving these people your business. I have taken two vehicles to A & B recently and I am so pleased with the repair results I am compelled to leave a review. It takes quite a fair bit to impress me and A & B have exceeded my expectations with both vehicles. Both repairs required partial painting, and I am so impressed that I cannot distinguish between the old paint and the newly painted panels. All aspects of the work completed are such you just cannot detect that anything was ever done. If you are looking for top quality repairs for your vehicle, go see Terry Thompson and his staff at A & B Auto Body. Best Auto body in town! I’ve been doing business with them for years, and it’s always done right and my car comes back clean and perfect every time! Thank you Terry and Shirley! I just wanted to say thank you to Terry and Keagan at A & B Auto Body for the awesome service they provided! Highly recommend the folks at A & B! Exceptional. That’s the work that comes to mind when I think about the service I received from A & B Auto Body. They really put customer service first and I couldn’t be more pleased to write this review. You won’t be disappointed if you take your vehicle here! Thanks for everything! I must share how much I appreciated the help that A & B provided to me recently and how their friendly, fast service was so amazing! I pulled up to A & B in a pinch after discovering the mirror dangling haphazardly off the side of my car. As luck would have it, this happened to be right before I had to get on the road to Saskatoon! Without an appointment, on a time crunch and rather flustered, I walked into the office fully expecting that I would need to postpone my trip and still pay an arm and a leg… Instead, I was met with kindness and exceptional customer service. The staff at the desk directed me to an available crew member immediately (who I’m pretty sure gave up his coffee break to assist me) and within minutes he had provided a simple yet effective solution to fix the problem and get my car road worthy again. On top of that, the fix was provided free of charge. I can’t thank Joey and the others at A & B enough for being so kind and quick to help. You’ve certainly gained a customer and I know I’ll be confident to recommend A & B to others in the future. We took our truck in for some repairs to the bumper through a SGI claim. Terry and his staff did a fabulous job to get the truck fixed, and even polished it up to look like new again. Great job at A & B Auto Body. You won’t be disappointed. Fantastic customer service and my car looks beautiful! I had a small mishap with my car and it only needed the dent to be pushed out but my car came back looking better than it did even before my accident! These people are wonderful to deal with and their work is amazing! Amazing service! The staff was so accommodating and kind. My van looked brand new again when I picked it up and I couldn’t be happier with the work that was done! I would highly recommend this business to anyone! Best auto body shop in Regina HANDS DOWN. Terry is great to deal with, and the paint is perfect. These are the only guys I will let touch my stuff.